I put on my “family” bracelet every day. All are grown, and one has passed but with the bracelet they are with me all the time. I love it. I had a new grandbaby and had another pearl added. The bracelet came back within a week and it is just beautiful. Love these bracelets. 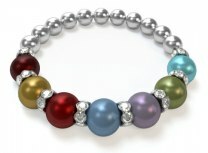 The mother’s bracelet was beyond my expectations. It is more beautiful than the advertisement. I am very please with it. I’ve bought 3 of your bracelets and my daughter and daughters in law love them. 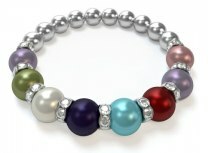 They are so pretty and a different kind of bracelet which they love!!! I absolutely love my bracelet. It is beautiful. I love my Mother's Bracelet and have added the pearls of my daughter in laws and my 3 grandsons along with my two sons, husband and me. Get a lot of compliments on it and as I have added the pearls along the way, the customer service has been great, fast and always added the pearl as I requested. Looking forward to adding at least one or two more pearls in the future. Lovely gift that was a hit. 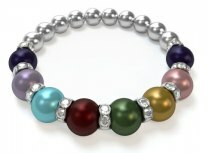 My wife loves her bracelet - would love to get her a grandma bracelet some day! I love your bracelets & necklaces. I have them for myself & have given bracelets as gifts to my friends who are new grandmothers. Love your jewelry! 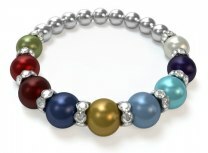 I love this bracelet and hope my stepdaughter does as well it’s a Mother’s Day gift for her.